City of light and spectacle… and of darkness and doom! The first modern science fiction motion picture! One of the earliest mega-budget films! A marvel of cutting-edge special effects technology! An ageless parable that is as relevant today as it was in 1926! A masterpiece that, like the Sphynx, exists only in its vandalized and incomplete form today! The motion picture Metropolis has an incredibly rich history in itself… and even with its tortured past and highly-debated presentation, it remains as one of the most influential movies of all time. Certainly the format of science fiction films and novels owes much to this pioneer effort. The Metropolis skyline: Massive buildings, painted backdrops and hand-animated miniature vehicles combined to bring us the ultra-modern city of the future, which would become a cinematic staple. In 1924, when filmmaker Fritz Lang asked his wife, author Thea von Harbou, to write a story for him that would be the basis for his next film, few science fiction films existed. 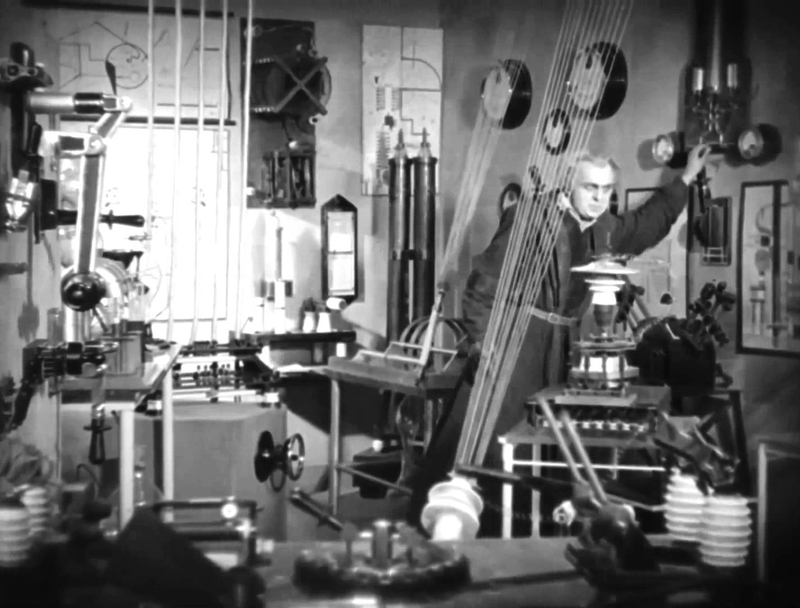 After the earliest age of shorts like Edison’s Frankenstein and Melies’ A Trip to the Moon, sci-fi concepts had just begun to be rendered seriously in feature-length films like Homunculus and The End of the World. But the concepts inherent in Metropolis—the mega-city, the class struggle and inequalities between haves and have-nots, the demands of automation, and the threat of technology run amok—were already common and highly-debated themes in science fiction literature, and major concerns in a world entering the second century of the Industrial Revolution. Lang and von Harbou’s message—”The mediator between the hands and the head must be the heart!”—is an almost over-simplified plea to emphasize humanity over industrialization, lest we allow industrialization to crush humanity utterly. Von Harbou delivered an epic script to Lang, and he set about the task of bringing her epic to the silver screen with gusto. In its execution, Metropolis became the template for modern science fiction movies. Its heavy use of allegory and symbolic representation, remnants of the German expressionist movement in early filmmaking, became the standard visual tool of sci-fi. Its equally stylized representation of technology, guided by the necessarily visual demands of the silent era and symbolized by baroque machinery, flashing light shows, intricate controls and incomprehensible displays, became the artistic backdrop required of standard sci-fi. And its depiction of the city of the future, complete with monstrous buildings, hyper-modern fashions, flying craft, and endless highways clogged with futuristic vehicles, are among the universal elements of motion pictures. Metropolis showed us the uber-horror of soulless technology run amok, destroying buildings and people, wrecking lives and societies. It presented the ideas that the demands of modern industrial civilization could ruin men, both physically and psychologically, if capitalism was allowed to rule over humanity—and that our machines could someday rise up and destroy us, if we were not careful and considerate about how they were used. And let’s not forget its robot: Futura (aka Parody), the beautifully-rendered art-deco woman-sculpture—worn by the same actress who portrayed Maria and the robot in human form—that inspired movie robots for the rest of the century… both the idea of human-styled robots, and of actors dressing up in robot suits to depict them. Though not the first robot in entertainment depiction (the stage creations of R.U.R. preceded it), it is undeniably the most elegant, certainly became the most famous, and was regularly used as the single image that represented the film on movie posters and art. Metropolis pioneered the extensive use of special effects to make its city come to life. Visual processes were invented or perfected for the movie, such as glass-painting and split-screen photography, that are still in use today. The use of miniatures and realistically-painted cityscapes, stop-motion photography, and hand-animated scenes were also used liberally, requiring one of the largest budgets of any film of the day. Metropolis‘ music was also on a grand scale, a full orchestral score complete with themes for individual characters, story arcs, action, and even parts of the city. The powerful, undeniably Germanic score served as the inspiration for the first sci-fi serials like Flash Gordon and Buck Rogers, who sometimes took their music directly from German operatic compositions. The tradition of the fully-orchestrated and commanding theme-based soundtrack is still popular today with sweeping sci-fi epics. For all of this effort, unfortunately, the audiences and critics did not “get” Metropolis when it was released… this movie, and science fiction in particular, was simply too unlike anything they had previously experienced. The resulting bad reviews and poor showings bankrupted Germany’s UFA film studio, which had sunk a huge sum of money into the production, even while sharing the costs with an American film studio. After a pathetically short opening, the Americans took over distribution of the film, and decided to trim it extensively to emphasize the spectacle over the substance. Rotwang and the robot: With a central character removed from the butchered script, the brilliant but tortured inventor becomes the prototypical Mad Scientist, and the robot’s female appearance becomes confusing and pointless. At the hands of people wholly unconcerned with the original plot or message of the movie, subsequent edits castrated the film, removing many scenes haphazardly, completely excising characters from the film—most notably Hel, the late wife of Joh Frederson, the master of the city; a central background character that fueled the conflict between Frederson and Rotwang the inventor. They subsequently rewrote the caption cards in a sloppy and uncaring attempt to further simplify the script, until over half the film was gone and the story was a simplistic hash. As the removal of Hel also removed the central motivation for the actions of Rotwang, leaving his actions and attitudes ambiguous at best, and unbalanced at worst, they ultimately resulted in another hackneyed sci-fi plot device: The wild-eyed Mad Scientist. Further edits were done by other studios and movie houses, to remove scenes deigned too racy or controversial for its audiences. After all this work, the movie became a disjointed mess, and audiences, if anything, got even less from it than from its original version. All that was left was a series of strange but pretty pictures, and a story that was juvenile and forgettable. But before any more repair (or damage) could be done to the film, World War II struck a painful blow: Allied bombing leveled UFA Studios, destroying the original negatives of the movie. As most of the copies of the movie outside of Germany were the already-heavily-edited copies, the result was the effective loss of the film as a complete work. Subsequent showings of Metropolis, throughout the decades, have been rebuilt from existing film stocks and occasionally-discovered negatives, none of which were complete, and many of which were in serious disrepair. Further, none of them presented the complete original story, and critics generally dismissed what was left of the movie as a beautiful work with a script of no value. All that was left was its imagery, which served as the essential template for future sci-fi filmmakers to emulate, even to this day. Later sci-fi movies borrowed from Metropolis‘ imagery, and what of the original film was recalled by its contemporaries, in attempts to match or exceed its accomplishments. The kinetic labs of Dr. Frankenstein and Dr. Morbius… the vast cities of Blade Runner and Star Wars… the humanoid robots… the stylish and futuristic clothing… the sweeping and heavily-themed orchestral scores… the grandiose social concepts… the warnings of Man’s folly, and the threats to our future… all of these elements, and more, are taken in whole cloth from Metropolis‘ groundbreaking production. However, its surviving visual elements, often presented at the cost of a sophisticated storyline, gave the impression of a genre that was immature, favoring style over substance, and struggling with concepts that were considered beyond its ability to effectively take on. The public’s impression of sci-fi thus established, few sci-fi movies managed to reach beyond that juvenile image, and the genre struggled with that immature label for decades. Fortunately, the original von Harbou novel survived intact, and by the sixties, was enjoying popularity as a re-released paperback book. The wealth of material in the novel, the many characters and complex themes, and the clearly coherent storyline, inspired buffs who realized how much of the original film work was clearly missing, and the poor remnants of the classic film were rediscovered by a new generation. In the seventies, serious efforts were undertaken by multiple studios and film buffs to scour the globe, tracking down every surviving bit of film, and reassembling the movie to as complete its original state as possible. As the years progressed, and film versions or negatives were found with scenes that had been missing in earlier versions, new film edits were introduced to the public, and limited film restoration efforts began. In the eighties, film producer Giorgio Moroder (known at the time for the success of his movie Flashdance), being a Metropolis fan, assembled and restored the most complete version of the film at the time, and released it with colored frames and a modern pop-rock soundtrack. Although he was lauded for his effort, the colored film and rock score did not win over many fans, the story was still disjointed and incomplete, and it was largely panned by critics. Moroder’s film, as ambitious as it was, has since fallen into obscurity with the rest of the earlier restorations (though used VHS tapes and pirated digital versions of the movie can still be found). As the years progressed, the original notes on the film were found or reconstructed from newfound sources. The original dialog cards were finally discovered, leading to a more accurate translation of the text to clarify major points of the script. Then the original film score was discovered, which also included notes on its timing with the script that further clarified many points of the story. It was performed by a modern orchestra, to be added to subsequent releases. In addition, computer-aided film reconstruction was reaching an incredible level of sophistication, allowing some scenes that were all but lost to age and deterioration to be recovered and cleaned up, and other badly-restored film to be rebuilt and clarified. The level of quality of many of those restored frames is nothing short of miraculous, a triumph of modern engineering and painstaking restoration effort. At the time of the 2002 release of Metropolis on video and DVD, restored by the F.W. Murnau Foundation, it was assumed that there were no other hidden caches of film or negatives remaining to be found, and that the latest edit of Metropolis would never be any more complete, nor would it look any better. The 2002 version also had the original score restored to it, as well as clarifying text cards that were more faithful to the original work. Then in 2008, a copy of what was purported to be the entire original film was discovered deep in the archives of the Museo Del Cine in Buenos Aires, Argentina. The film was immediately flown to Germany, where experts certified it as authentic. The newly-discovered copy clarified numerous plot-points, and fleshed-out the character of Slim (aka Schmael), Joh Frederson’s lieutenant/spy. The badly-damaged 16-mm film required extensive restoration, much like the efforts that were made on other filmstocks and negatives to produce the 2002 version. The 2010 version, now billed as “The Complete Metropolis,” is 145 minutes long, released in limited theatrical runs in 2010, and released on DVD and Blu-ray in November 2010. To date, the 2010 restored version of the movie is considered “the best it will ever be.” However, the “best it will ever be” milestone had been claimed before, and always, another bit of the original had been found and added to the sum of Metropolis‘ remains, like finding a bit of bone in a fossil that brings us closer to a complete skeleton. We may never know when the version of Metropolis that we have will have to be considered “the final, definitive copy.” But in the meantime, we can enjoy this cinematic marvel, and finally recognize it as the masterpiece that has inspired generations of film-goers and film-makers, novelists and designers, and anyone who has a concern, or a hope, for the future. Metropolis is the mother of modern science fiction films… the direct inspiration for the form and design of movies like Frankenstein, Flash Gordon, Star Wars, Blade Runner, 2001, Logan’s Run, Forbidden Planet, and untold hosts of others. Without it, who knows what science fiction cinema would be like today. 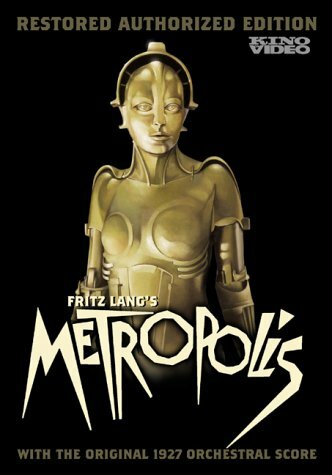 To purchase the DVD, or to learn more about this classic film, visit Kino International’s Metropolis web site, and the Wikipedia entry on Metropolis. Previous Previous post: What! Not another #%@&!*$!! blog?!? And I thought trying to recover all the lost episodes of Doctor Who was an epic struggle. The story of trying to recover this movie is probably one of the most important stories of science fiction history I’ve ever heard. Certainly an epic stranger-than-fiction history, befitting an epic movie.